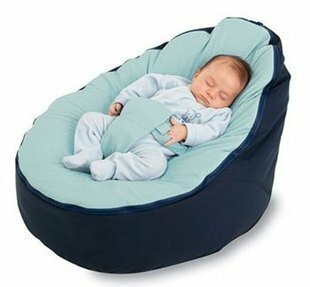 Baby bean bag chairs are fantastic for our precious children, as their soft little bodies just melt into these chairs and they feel very comfortable as they nap in a great chill sack. It has been argued that that hard baby seats and rockers can cause a serious condition known as Flat Head Syndrome in babies. Baby beanbags minimize the risk of this, while still giving your baby somewhere comfortable and secure to sit, chill or sleep. Here at StarWalkKids, we know that only the very best will do for your precious little one, and in this review we give you our recommendations for the best infant bean bags available right now. There are all types and sizes and the baby bean bags a slightly smaller than the larger bean bags for older children. Filled or not filled? While most bags come pre-filled, but what are the facts about best filler? some do not come with any stuffing and you have to buy or make your own. Its a good idea to double check this before you buy that the bag or chair you’ve been looking at. Luckily, you can also buy beans and stuffing online. Sleep or Awake? Some bean bags are made for babies to sit or sleep in, while orthers are only designed to be used when the baby is awake. Again, make sure you check before you buy so you know what you are getting. Washable As all parents know, no matter how careful you try, babies are always going to make a bit of a mess at some point. A good beanbag chair should be made of a wipeable fabric, so vomit and fluids can easily be cleaned up, and they should have removable covers that can go in the washing machine. Safety As always, safety is the number one concern in all baby items, and these chairs are no different. Are these baby bags safe to use? Firstly, you should make sure that your chair has been properly ergonomically designed for babies soft bodies, and they should be made of non-toxic and environmentally friendly materials. Also, make sure that it has secure double stitching to make sure that ne beans or stuffing leak out. The last thing you want is for your precious lttile tot to try putting some of the beans in his or her mouth. We all know how much babies love sleeping, so why not give your little one a great and comfortable baby sleeping beanbag to nap in? Especially designed to help to your babe let the gas out and avoid the build up of nasty tummy acids, your child will feel safe, secure and oh so cozy sleeping on this. This cool bag has is full over locked and double stitching for security and comfort, which gives it extra strength also makes sure that no beans will spill out. It is very light and portable, so you can take it anywhere with you. This bean chair also comes with a seat belt, to ensure that your child stays secure and face up. This really is a perfect little nest for your newborn to feel safe and secure in. With these wonderful baby loungers, you can play with your child without having to hold them, so you can be hands free and still take care of them. 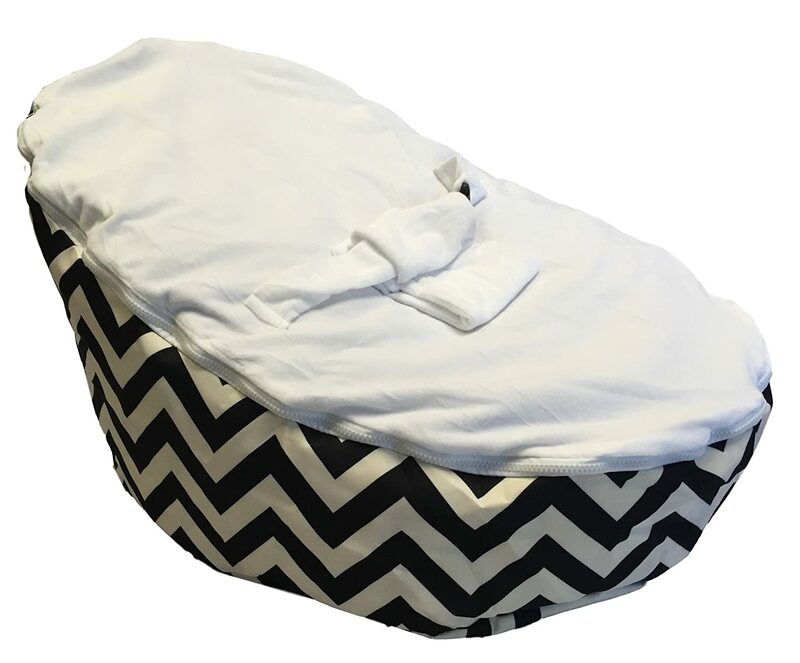 It is uniquely designed with a recessed interior perfect for a newborn’s bottom, so your baby will feel like a little prince or princess when they sit in this. 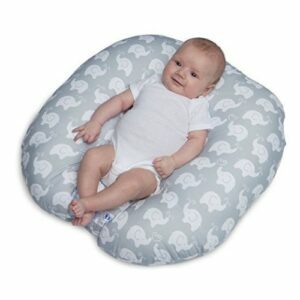 This Boppy pillow is made from soft, wipe-able fabric – ideal for busy new parents. It is a great baby shower gift, and can be used by newborns. We also really love just how practical this newborn baby bean bag is. It can be wiped down for spills and it is also is fully machine washable, so the entire pillow can go in the laundry if need be. It is also very light and compact, so you can take it with you anywhere you go with its convenient carry handle. This great bag is pre-filled and ready to go right out the box, so you won’t have to worry about buying filling for it. 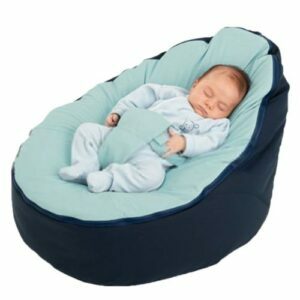 These bayb bean chairs have been specially designed for maximum comfort, and your child will just love nodding off in this comfortable little newborn baby beanbag. The stitching on this bag is very strong and secure, so you don’t have to worry about the filling coming out, which could be especially dangerous as you child might swallow some. It is also, light, compact, and very portable, so whether your taking it on a family holiday or just letting baby have a snooze while you catch up on some Netflicks, this is going to be a great addition to your baby chairs and beds. Now aren’t these just adorable? These animal bean chairs come in all kinds of versions, including cows, elephants, monkeys and dinosaurs, and each one even comes with a matching soft toy for your baby to play with. We also love the fact that this manufacturer strives to be as environmentally friendly as possible, and these are made from 80% recycled materials, so you can be confident that you are buying a great baby chair and supporting a great eco-conscious and landfill-free company. It is also small and portable, so you can easily take it with you to different rooms in the house or even take it on trips and holiday. Best of all, the stitching is very tight and secure, so you won’t be worried about any of the beans spilling out anytime soon. The Podster is is a unique lounging style chair for your baby that works like a sling, making your baby feel like it is in a warm embrace.It has very strong support from its sloping sides, and you can use the tabs to adjust the size of it so it fits your child perfectly. it is also very practical, with a removable cover that can be washed. Maybe you’ve already got beans or stuffing from another chair, so you’re looking for an unfilled bag to put it in? In that case, we’ve got a great baby beanbag bed for you! This bag is very adaptable, and your little one will feel relaxed and safe in it. It also comes with two removable soft top seat covers, one with a three point safety harness for infants and one for toddlers and older children to use the bag as a comfy chair. So, basically, this can be used for the baby when it is very small and then as a chair when the child grows older. That really is good value for money. This is pretty light weight, so moving it around will not be a problem. Also, it has been designed to help babies deal with acid reflux, so hopefully it will help keep colic down. If you already have some bean kicking around, this might be a great bag to try out. 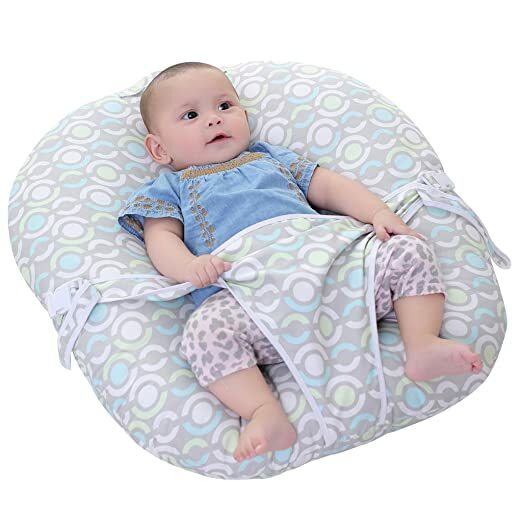 Babies will feel wonderful in this cool lounger pillow, as it is designed to give them an elevated seating position and maximum comfort and support. Feeding with babies in this position can help reduce acid reflux. Wigglers and squirmers will love this great baby lounger, as it holds them securely in place but doesn’t constrict their movements too much. It is also made of soft, wipeable fabrics, so any spills or vomit can be easily cleaned up. These loungers really are life savers for mums and dads, as it allows them to interact with their kids while remaining hands free, and the safety harness will make sure that they don’t roll over or fall over. This baby bean bed comes in a choice of 4 great patterns, to suit both baby boys and girls. It can be used from birth right up to school age, making it an excellent investment. There is a secure three point safety harness, perfect for keeping young babies safely lying on their backs. The beanbag chair is ideal for toddlers, too. The upper seat layer with the harness can be removed, and replaced by an ordinary one without the straps, which is included in the box. The chair can easily be cleaned, even if baby makes a mess at feeding time. It’s comfortable enough that baby can sleep in it too, as well as eating and playing. The chair is strong enough to comfortably hold kids weighing up to around 65 pounds, meaning it will provide years of use. 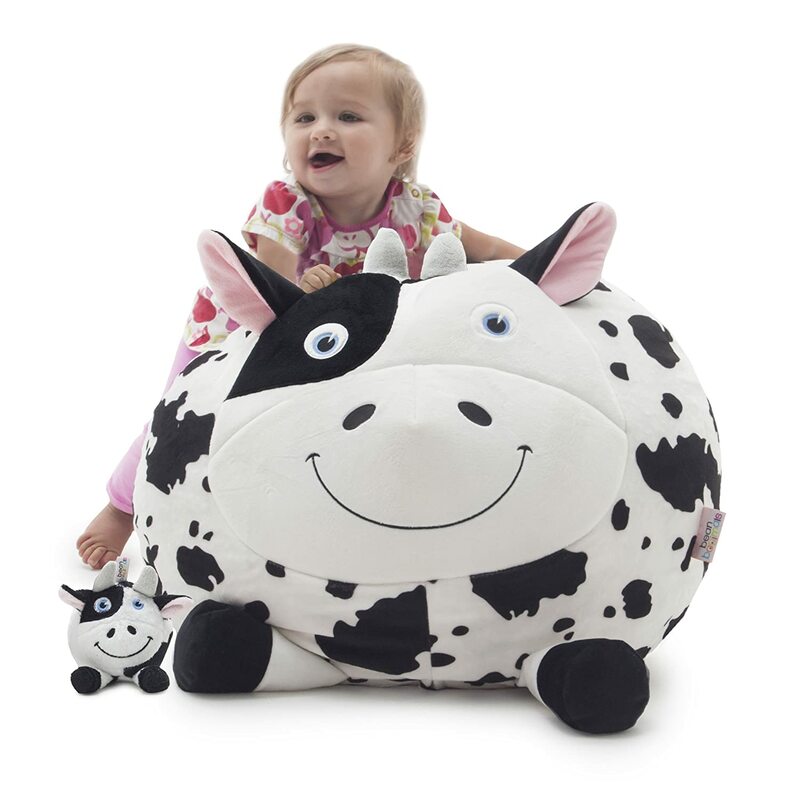 This baby beanbag comes without stuffing, so you can fill it to your baby’s liking. Simply purchase a large bag of beans and pour them into the base. It comes with a base, and two different upper layers meaning it can grow with your child. This means the harness can be removed when your baby no longer requires it. 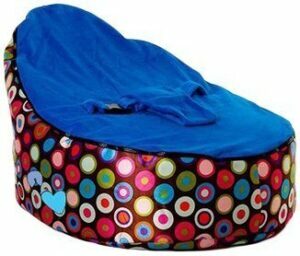 The cheap baby bean bag chair is made partly from PVC, making it easy to clean in the event of an accident. It is easy to transport from room to room, making it easy for busy parents to keep an eye on their little ones. This baby sit me up seat can be used by infants as young as 2 months old. It’s great for babies who like to be able to see what’s going on around them. It’s also ideal for feeding. The sit me up floor seat comes in a choice of many colors schemes, meaning there’s something to suit everyone. 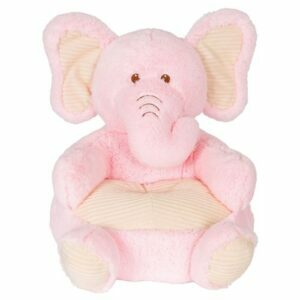 This super soft baby armchair comes in a choice of styles, including elephants and giraffes. It’s great for toddlers, and older babies who can already sit up independently. 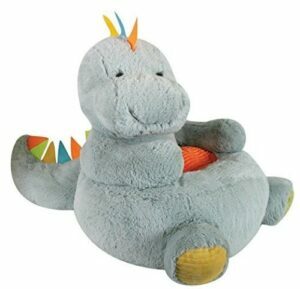 Children will love the cuddly, soft material – the chair can also be used as a toy to play with! This chair will be a great addition to any play room, and your child will love siting in it.. This infant soft chair is ideal for babies, as it is warm, cosy and fuzzy, letting them well warm and safe when sitting in it. The beanbag for toddlers is not ideal for feeding, as it can only be spot cleaned. As doesn’t have a removable cover, it cannot be machine washed. However, it is well-made from strong and durable polyester which will keep your baby comfortable and warm. The BabB Beanbag comes filled and ready to use straight away. This safe bean bag chair has very secure stitching to ensure no beans can escape. The comfortable, padded strap ensures that babies remain face up. 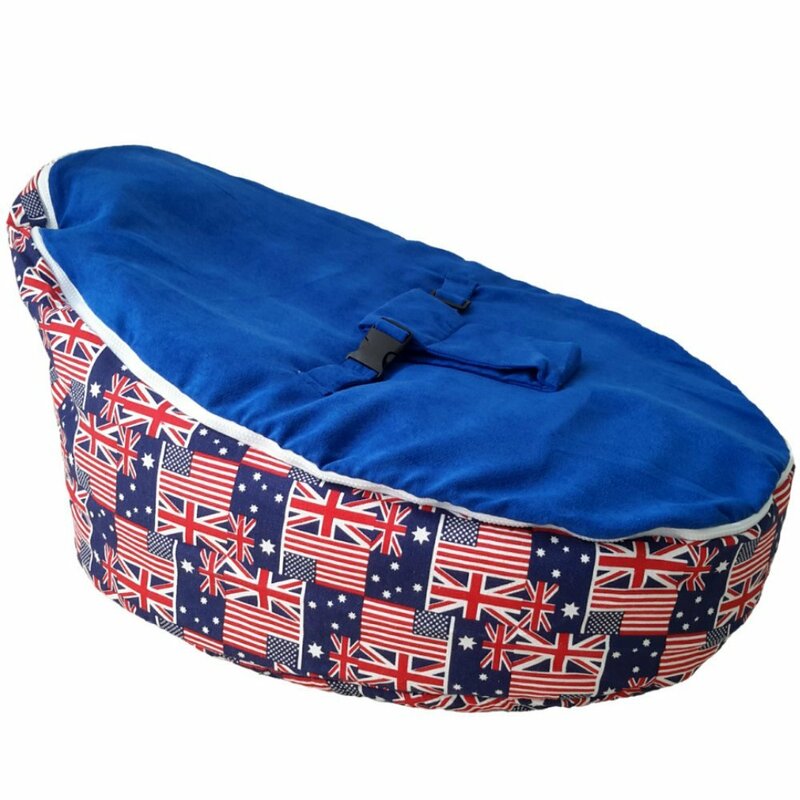 The baby bean bag bed is very light, so it can easily be moved around the house, or taken out and about when visiting other peoples’ homes. 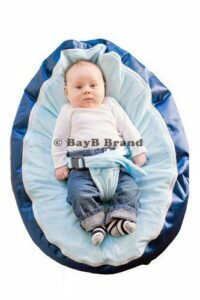 Overall, the BabB beanbag is a great choice for parents who are looking for something safe and long-lasting. 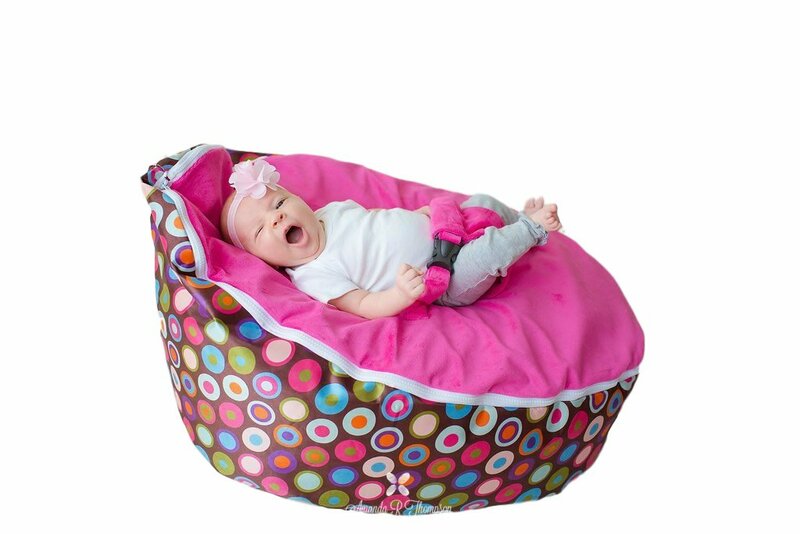 It is easy to clean and very comfortable for babies to sit in, as well as being ideal for supervised naps. This adjustable infant lounger seat can be adapted to grow with your baby as they get bigger and heavier. Thanks to is adjustable tabs, you can tighten or loosen the chair in order to get the best snug fit for your little one. As your babe grows, the baby support pillow can be used to sit baby up, whilst keeping them securely supported. The baby support chair comes with a removable cover which can be machine washed in the event of spillages or accidents. 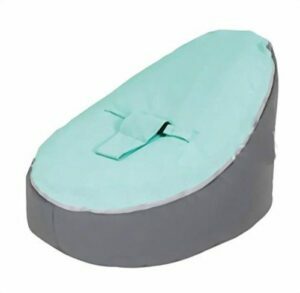 This safe bean bag chair comes in a choice of 4 colors, and would make an excellent and unique baby shower gift. This infant beanbag chair comes unfilled, and requires around 100 L of beans to fill it. The top cover can be machine washed, making it easy to clean up if there’s an accident. The fabric is very soft and comfortable – babies will love to lay in this chair to relax or play, and watch what mom and dad are up to! It was hard to go with just one of these awesome bean chairs, but if we we’re off to a desert island with our family and we could only pick one, it would have to be the Bayb Pink Bag. These are so simply yet just so brilliant at the same time. They help reduce acid reflux in your child and the risks of flat head syndrome, and babies really love chilling out in these great little infant loungers. You can also be confident that the safety harness is going to keep them from slipping or accidentally turning over. Finally, with such high quality stitching, parents will never have to worry about any beans popping out of the cover and finding their way into your baby’s mouth. All in all, we fully recommend that as our top pick! If you’re on a bit of a tight budget, you really can’t go wrong with the Boppy Baby Lounger. 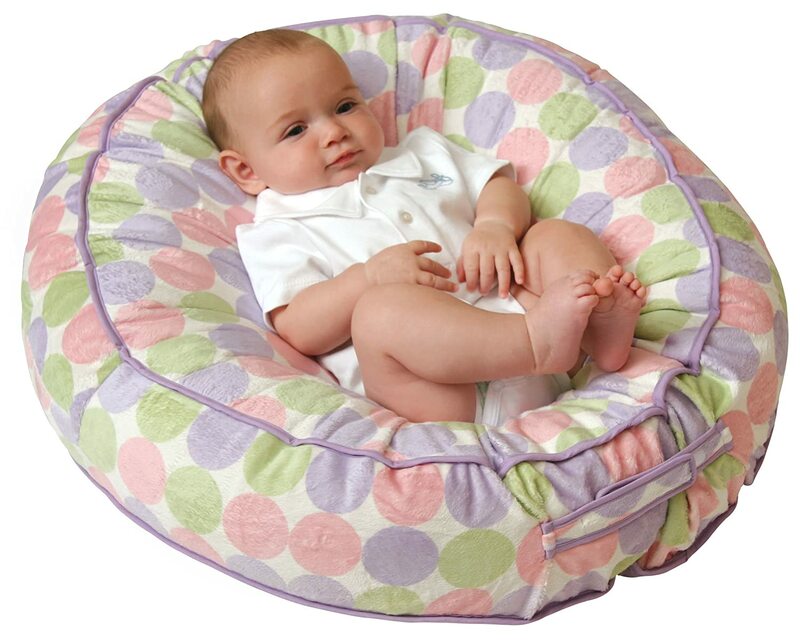 It is a nice cheap baby beanbag, and it has been specially designed to be comfortable and safe. It also helps with the babies digestion. The only downside to this is that they are not really designed for babies to sleep in, but the advantage is that they can sit in the child lounger while you have your hands free to play and interact with them. It is ideal for feeding or playtime, and makes a great baby shower gift. The Boppy is also much easier to keep clean than a traditional beanbag – the whole pillow can be washed. Overall, a great choice for parents on a budget, will won’t last as long as some larger beanbags, as it can only hold up to 16 pounds. It has excellent safety features for newborns, and can also be used by older babies and toddlers. 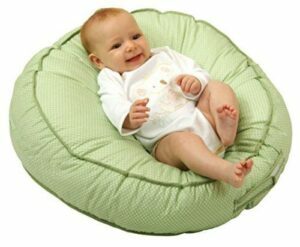 The beanbag is great for preventing flat heads in young babies, and is also the perfect angle to prevent symptoms of reflux after feeding. Babies will be so relaxed and comfortable in this chair – it’s ideal for playing, resting and feeding!